Keep the Peace, Shed the Fleece! If you're like me you have more yarn than sense. It's my goal not to purchase ANY yarn this year and to complete the projects I have on my to do list. If you want to join along just send me an email - address on the right under links. Here is the book I got the caterpillar baby pillow pattern from. 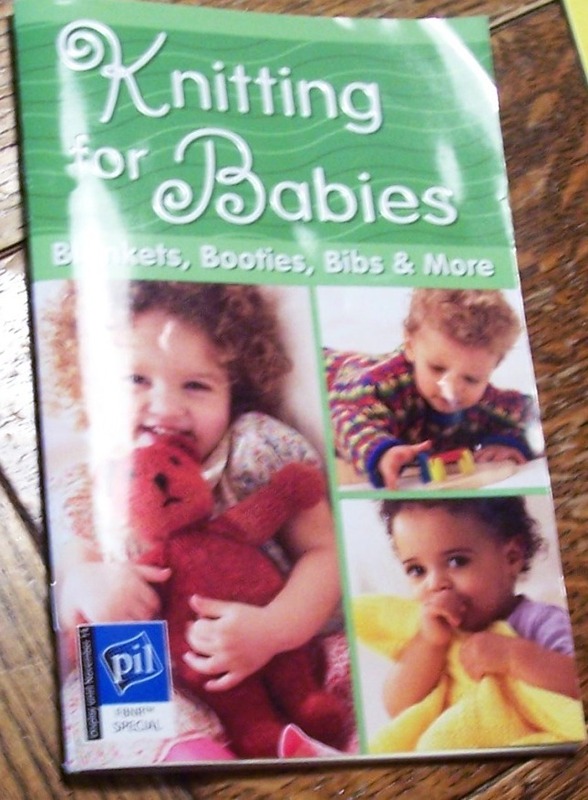 There are so many cute items to knit in here. I have, in my magnamomous stash, yarn to make a dress that is in here for Miss K. I purposefully bought enough yarn to make it this winter for her to have for spring-summer 2008. Told y'all I have a huge stash! 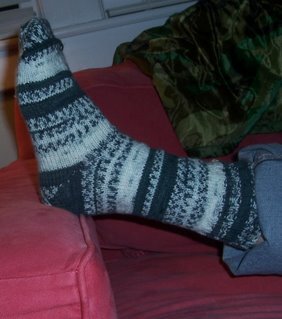 Here is completed sock #1. I made this using Priscilla's Dream Socks pattern available from the Interweave Knits site. It's a members only pattern so if you don't subscribe to their magazine maybe you have a friend who does! The heel and toe are done in short rows and Mr. K really liked how that felt, much more so than a kitchner stitch close done just at the tips of the toe. The yarn is Moda Dea in Stormy. I like the self-striping yarn pattern but I have to say that I'm not a huge fan of acrylic yarn but Mr. K will not hand wash his socks and it will take a few reminders that they can't be machine dried. I believe that the recipient is an important person in the knitting equation and washability was a factor. It's my hope that once he gets used to the feel of custom made that we can move on to a finer gauge done in a Merino wool, and that he will be so delighted that he will cringe at the thought of tossing the precious jewels in the washer!